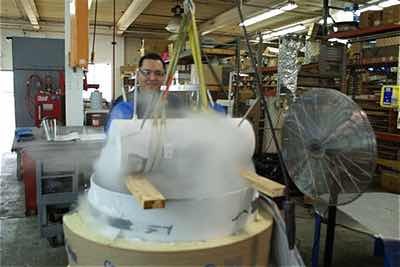 A Newcomer’s Introduction to Cryogenics - Meyer Tool & Mfg. The following article, written by Meyer Tool Project Manager Michael Svehla, appeared in the June 2015 issue of Cold Facts, the magazine of the Cryogenic Society of America. It appears here with permission. I was extremely excited to join Meyer Tool & Mfg., Inc. as a Project Engineer/Manager several months ago and begin working in the cryogenic field. As an engineer with 20+ years of experience, 18 years of that dealing with specialized types of vacuum equipment, I felt I was prepared to hit the ground running. As I gained more experience in cryogenics, I was pleasantly surprised on how much knowledge I was able to tap into from both my past work experience and what I was taught in college. But I’ve also found that I must keep the phrase “you don’t know what you don’t know” in the back of my mind at all times. Almost immediately I had the opportunity to work on projects involving three common cryogenic fluids; liquid nitrogen, liquid hydrogen, and liquid helium. We all learn about these as gases in the periodic table in chemistry class, but until you’re given an opportunity to work with these as fluids in process equipment, some of their nuances are not readily obvious. While all have very low boiling points, liquid nitrogen (-320°F), liquid hydrogen (-422°F), and liquid helium (-452°F), each has very different properties. Both nitrogen and helium are inert and non-flammable, while hydrogen is flammable with a wide flammability range in air. In my past project work, I worked with ethylene oxide, a flammable gas used for medical device sterilization. Ethylene oxide is not a cryogenic fluid as it boils about 55°F, however, the process of medical sterilization used nitrogen to inert the ethylene oxide during the sterilization cycle. It’s fascinating to see the cross over use of nitrogen as a cold cryogenic fluid, to an inerting agent in a completely different industry. The similarities in flammability and reactivity between hydrogen and ethylene oxide bring me to my first instance of “you don’t know what you don’t know”. Ethylene oxide is a very reactive gas. Teflon is considered the best material for use with ethylene oxide for seals. Because of the similarities of hydrogen and ethylene oxide, a logical guess is that Teflon is an acceptable material to use with hydrogen; this is even shown in material compatibility charts. However, Teflon can become brittle and flake at cryogenic temperatures. Luckily, I have experienced coworkers who were able to explain this to me, to keep me for from falling into the pitfalls of “you don’t know what you don’t know”. A second similarity of using ethylene oxide and cryogenic fluids is that the material used for the pressure vessels is austenitic stainless steel, selected for its corrosion resistance in one case, and for its low temperature properties in the other case. In my past work on pressure vessels being built for the ASME code, I had to be aware of the reduction in the allowable stress level due to elevated temperatures. The ASME code has an allowable stress for 304SS of 20ksi at -20 to 150F, with a reduction as temperature rises: to 16.7 ksi at 200F, and 13.8 ksi at 400F. Never having previously worked on vessels with temperatures less than -20F, I never had a reason to consider what happens to the allowable stress at those temperatures. I think if you had asked me, without thinking I may have guessed that -20 to 100F is the “base line” value, and movement in temperature above or below this temperature range results in a decrease in allowable stress values. In reality, metals yield strength increases as temperature is lowered. (However, the ASME Code doesn’t allow you to exploit this fact.) This would be obvious if you were to extrapolate the allowable yield stress in the ASME code, but never having had the need to look at material properties at cryogenic temperatures, I never considered it. But this is only the half the story with metals at lower temperatures, because metals become brittle when they get cryogenically cold. I do remember learning this in college, but until now, I never had an opportunity to consider the ramifications of the low temperatures on the strength of metals on equipment being built. One of the biggest learning curves a newcomer to cryogenics has to overcome is the requirements of the ASME code for Charpy impact tests for metals in low temperature use. I can distantly remember learning about yield tests and the Charpy impact test in class at the University of Illinois, but until you work in the cryogenic field, the need for the Charpy impact test is not obvious. Some things in my introduction to cryogenics initially appeared to me to be completely new, but in reality have closed the loop on things that I learned in college, but have forgotten since then. One of the first projects I worked on consisted of building a cryogenic distribution can with JT valves. Throughout my career I have worked with many types of valves: ball, butterfly, needle, and globes among others. But never had I come across a JT valve. When I asked a coworker what a JT valve was, he recommended that I look up Joule-Thomson in one of my college text books. Referring to my Fundamentals of Engineering Thermodynamics book, sure enough, the Joule-Thomson process was explained. While I didn’t remember learning about the Joule-Thomson process in college, I had seen it in practice with liquid ethylene oxide passaging thru a throttle valve, vaporizing, and dropping the temperature of the valve and frosting over the valve on the outside. The experts at Meyer Tool have introduced me to things that are truly new to me and unique to cryogenics. One interesting concept is liquid nitrogen cold shock testing. I had never heard of cold shocking before, and have come to learn that is one of the specialized techniques used in building equipment for cryogenic use. Once I studied the Meyer Tool procedure for liquid cold shocking, the need for it was clear. The rapid change in temperature and resulting stress and change in length can cause joints to fail and leak that would not have failed under pressure and vacuum leak testing only. The cold shocking identifies these defects in the manufacturing stage before the equipment is put in-service, where they can experience those very stresses. Various types of cold shocking can be used, immersion, fill, and spraying, depending on the type of joint and size of part. I was surprised to see pictures of whole heat exchangers being entirely dunked into a tank of liquid nitrogen for cold shocking. Seeing the liquid nitrogen dance, for the first time, on the part being spray cold shock tested was a memorable moment. A second and unique concept in cryogenics that is new to me is multilayer superinsulation, commonly referred to as MLI. MLI consists of multiple layers of a low-emittance radiation shield and a low conductivity spacer. The MLI looks completely different than any type of insulation that I have utilized before, such as fiberglass batt insulation and polystyrene panels. I have an ASHRAE book from 1966 and 1967, which described MLI as a “Relatively new type of insulation. . . First developed by Peterson in 1951”. It’s interesting to see the book describe something as a new process, in which my coworkers are experts in. I have learned that the skill and techniques used in applying MLI are the most critical factor for successful use of the insulation. Fortunately, I have coworkers who can explain to me the differences between MLI blankets, spiral wound MLI and spiral wrapped MLI. As my experience in cryogenics grows, I am continually pleasantly surprised that the cryogenic field is an opportunity to utilize what you have learned not only in the engineering classes in college, but in chemistry and physics as well. Cryogenics is truly a fascinating intersection of classroom theory and practical knowledge. I look forward to learning as much as possible about cryogenics from my coworkers, and look forward to the day when I graduate from being the newcomer in cryogenics needing to ask why, to the teacher of the cryogenic newcomer to share why and how.